Visit the Brandywine River Museum of Art this weekend for an all-family feast for the eyes. The new exhibition “Get the Picture! Contemporary Book Illustration” is in full swing and an absolutely delightful show, superbly guest curated by H. Nichols B. Clark. 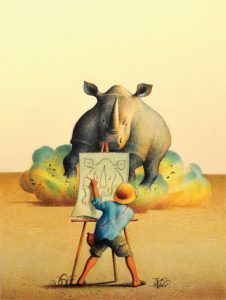 “Get the Picture!” presents several works by 8 prominent children’s book illustrators. There is a huge variety in illustration technique, from digital images, to drawn, painted, and collaged. Often the final image is shown adjacent to the sketch or concept drawing which offers a fascinating glimpse into the creative process. This is a stand out show that everyone will enjoy and talk about afterwards. Paired with the exhibition are a month of activities for children and families as well as lectures and book signings by many of the exhibition artists. This Thursday, August 28, from 11am to noon, Caldecott winning artist Brian Collier will join in the activities of “Museum Explorers Family Workshop: Art Sounds”. Families will creative images at the museum, inspired by the sounds of jazz music, and Brian Collier will greet everyone and signs some of his most collected books. What fun! Featured illustrator Raul Colon’s work is also very exciting. Mark your calendars for Sunday August 7th to hear Raul Colon talk about the creative process behind his book “Draw!”. Also August 10th, illustrator Melissa Sweet and author Jen Bryant will discuss their collaborative process in creating their award winning book “A Splash of Red: The Life and Art of Horace Pippin.” After visiting the show, remember to go to the first floor, where the permanent collection of NC Wyeth’s will always leave you spellbound. His Treasure Island illustrations are considered by many to be the finest example ever of American Illustration, and even after seeing them hundreds of times, they are full of power and wonder. The Way Back by George A.”Frolic” Weymouth. Also at The Brandywine River Museum of Art is the intimate show of select works by George A. Weymouth, which is closing this weekend; so if you have not seen these works, now is the time. Most of the works have not been on public display before now, either held in private collections or the artist’s personal collection. 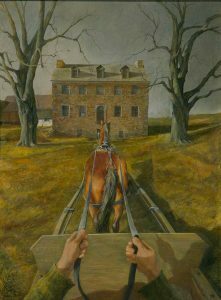 I particularly liked his portraits of family and friends and his moving image “The Way Back” showing what I assume to be Mr. Weymouth at the reins of his carriage heading towards his home in Chadds Ford. The Brandywine River Museum will hold a major George A. Weymouth retrospective exhibition in early 2018, and this small show will give you a taste of what is to come. As most people know, Mr. Weymouth (“Frolic”) was responsible for creating the Brandywine River Museum of Art as well as the Brandywine Conservancy and was Chairman of its Board since its inception in 1971. He had a larger than life personality and generous warmth and compassion that touched so many people in our area and around the world. His gift to the Brandywine area in incalculable, and his beautiful art images give us a glimpse into his private world, into the people, animals and natural beauty that he cherished most of all. Mixed Media: An Off Site KSQ Pop Up! 01/25/2019 · Comments Off on Mixed Media: An Off Site KSQ Pop Up!